This description of Zarah Bruhn's work was prepared when Zarah Bruhn was elected to the Ashoka Fellowship in 2018. Zarah is creating a viable, sustainable pathway to employment for refugees arriving in Germany by adapting a temporary employment model. With over a million refugees having already arrived in Germany, integration into the labor market is a key condition for their successful integration into German society as a whole. Zarah found that the main barrier for companies to employ refugees is a concern about the level of effort required to do so successfully and the associated risks. German companies have been very open to the idea of employing refugees, and numerous efforts have emerged to support refugees in the labor market integration process. However, these efforts have generally been approached in financially unsustainable ways that still ask companies to bear more risk than they’ve been willing to take on, especially at a scale large enough to address the size of the challenge. Resultantly, Zarah has created a strategy to remove that risk and build in financial sustainability. Through Social Bee, Zarah takes integration efforts off the shoulders of the company by using an adapted temporary employment model through which Social-Bee employs refugees and subcontracts them to corporations, while creating the conditions for long-term employment. With a deep commitment to supporting refugees and their search for permanent employment, Social-Bee assumes all integration and qualification efforts, supports the success of the relationship between company and refugee, and develops expertise that makes them much more efficient in handling complex situations than companies would be. With the success stories that Social-Bee creates, Zarah ultimately seeks to shift the mindset of employers and also the public, defusing the growing resentments against the newcomers in Germany. Furthermore, she wants to set new norms for the industry of temporary employment, showing that it can be a powerful tool for long-term labor market integration if social impact is the bottom line of its activities, rather than only financial return. Of the 1.3 million refugees of working age in Germany, only 20,8% have found work in Germany so far (Federal Labor Office, 2016). Long-term unemployment particularly affects low-skilled immigrants, and 74% of all refugees in Germany don’t have formal vocational training. At the same time, there is actually high demand for blue-collar workers, and 85% of companies are generally interested in employing refugees. However, they shy away from the bureaucracy of the complicated asylum system, the high search and selection costs, the complex personal situations of refugees, the lack of good language and other skills and cultural barriers. Existing state programs do not have the budget, and thus the capacity, to address the large number of refugees. Many of their programs are directed towards young refugees at apprenticeship age. Especially for middle-age, low-skilled refugees, solutions are missing. Apart from state efforts, there are also many non-governmental initiatives to address job-market integration. For instance, job-posting platforms make job opportunities transparent, but do not path the way forward. Few job-placement agencies try to match employers and refugees. However, their service is very resource-intense, and many companies are not willing to pay for it. To help refugees to prepare for the job market, many state and non-governmental programs provide application training or skill qualifications. These are all necessary activities, but they are often isolated measures and do not address the complex systemic barriers at the refugees’ and employer’s end. 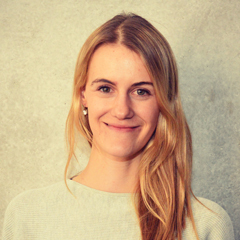 With Social Bee, Zarah Bruhn is addressing the main systemic barrier for job market integration of refugees: the perceived risks and fears of companies. She does so by leveraging the potential of temporary employment. By assuming the role of the employers themselves, Social-Bee takes on all integration efforts, thereby absorbing the risks and efforts that employers fear, while helping refugees create paths to self-determined careers. Social-Bee’s primary target group is middle-aged, low-skilled refugees. By offering a solution for this group, she directly steps into the gap of existing programs. Social-Bee also currently focuses on the warehouse, logistics and security industries because these industries have the biggest submarket of temporary employment (30%) with the highest growth potential (10-20%). Like a common temporary employment agency, Social-Bee recruits and hires refugees, taking full employer responsibility, and places the employees in jobs in other companies. But unlike conventional agencies, Social-Bee’s subcontracts last for approximately one year, so that the employees get a real chance to learn and become integrated into the company. Additionally, Social-Bee adds holistic integration support to the equation. The employees receive social counseling, language training and can participate in free time activities which also involve their families. To address potential conflicts at the workplace, Social-Bee also offers conflict mediation. Last but not least, Social-Bee provides professional development for employees. For each employee, a development plan is agreed to. They get support by a personal mentor and access to further qualifications. It is Social-Bee’s goal that at least 80% of their employees get permanent positions after at the latest 1.5 years, either through a hire by the client company or through being employed by another company. It is part of Social Bee’s strategy to link their work with existing state and non-governmental programs. They cooperate with volunteer networks, welfare organizations and state programs to recruit their employees. They incorporate other organizations’ services into their support program. For instance, external partners provide the language training or free time activities. Furthermore, they work closely with the Federal Labor Office, receiving integration subsidies for their services. With their role and services, Social-Bee functions as an intermediary between employees and employers. They have proximity to both sides. They help refugees understand the expectations, working culture and mechanisms at the work place. And they help their clients understand the complex life situation of refugees, thus increasing their patience. They have successfully supported both sides through the often rather bumpy start of the job relationship. In general, temporary employment agencies have a rather bad image in Germany. It is their official aim to become a bridge to permanent employment, but in fact it is not their business interest to do so as they earn money through subcontracting. To clearly differentiate from traditional temporary employment agencies and increase their credibility, Social-Bee is a non-profit entity. Although they depend on seed funding for opening new locations, their model is self-sustaining in the mid-term. Thanks to receiving state integration subsidies, they can compensate the higher costs of their integration support and are therefore able to offer their clients the same price as conventional agencies. When working with Social-Bee, companies have less flexibility than with conventional agencies and need to commit to the idea of integration. Social-Bee’s clients actively decide to work with Social-Bee because they want to assume this responsibility. Social-Bee started in 2016 with a handful of pilot cases. After one year, these pilots proved successful. Companies were very satisfied with the job relations, and all pilot employees got permanent positions. Thanks to this success, in March 2017, Social-Bee got solid seed funding to expand their team, roll-out their activities in Munich and to open a second location in Rosenheim. In the past few months, they have subcontracted 31 employees to 12 clients with a contract volume of around 600,000€. Social-Bee’s clients are big corporations such as IKEA and Aldi. Aldi just signed a master contract with Social-Bee, enabling Social-Bee to work with all of the Aldi branches nationally. Social-Bee is currently in negotiations with some of Germany’s biggest stock exchange corporations and will double their number of employees by the end of the year. They aim to become Germany’s biggest employer for refugees, with 6-7 hub offices, each with 500-600 yearly employees. For 2018, hubs in Stuttgart, Cologne and Frankfurt are in the pipeline. By becoming a big employer for refugees and through collecting knowledge on the (inconsistent) interpretation of asylum law by local authorities, Social-Bee is building a strong lobbying power to challenge the legal framework for job market integration. Even though the warehouse, logistics and security industries alone offer huge potential, Social-Bee wants to tap into other industries to provide more options and opportunities for refugees. Because their current industries generally recruit male workers due to the physical demands of the jobs, and taking into account cultural considerations in the refugee communities, Zarah is looking to the caregiver sector as a way to begin to engage more refugee women as employees. In the long run she hopes to expand their program to other underemployed communities, such as migrants in general, seniors or people with disabilities. With Social Bee, Zarah does not only want to directly create job relations. She also intends to have a significant impact on the ecosystem of the employee, the private sector and the broader public. There is frequent anecdotal evidence about how the success of the employee empowers family and friends to integrate better. Social-Bee is actively fostering this dynamic by including family and friends in the activities they offer. Also, there is a strong impact on the staff of the client companies, helping them to overcome their prejudices. With the success stories that Social-Bee creates, Zarah aims to motivate more companies to employ refugees and to defuse the public resentments against the newcomers in Germany. She is currently working on a media campaign with “Jung von Matt,” one of Germany’s biggest communication agencies, to advocate for the competencies and capabilities of refugees. In the long run, Zarah wants to set new norms for the whole industry of temporary employment, showing that it is a powerful tool for long-term labor market integration if social impact is the bottom line of its activities instead of focusing only on financial return. However, it is also Social-Bee’s goal to make their integration model scalable beyond temporary employment. They want to do so by spreading their unique expertise in job-market integration to other companies, e.g. through trainings. Zarah enjoyed a sheltered childhood in a very value-oriented family. She always knew how lucky and privileged she was and felt the strong wish to give something back. It was at the age of 24 when she found her way to do so. It was the year in which over 1 million refugees arrived in Germany. Zarah became friends with a refugee from Syria in a class they were both taking. They volunteered together in refugee welcoming initiatives and worked together in class on developing project ideas to support refugees. However, Zarah felt the need to do more than just welcoming work. She had quickly captured that the main challenge for refugees is employment, more specifically finding a low-barrier entry into the job market. With her background as a Business Administrator, she also knew the perspective of the potential employers and the barriers on their end. Discussing the challenge with friends and colleagues, Zarah always came to the same conclusion: temporary employment could be the key, if it only truly intended to integrate people. With temporary employment having a rather sloppy image, Zarah was declared crazy by many people, but she could not let go of the idea. She gave up her projected business career, paused her studies, quit her job and pitched the idea to friends and family to raise loans. She struggled against all critics and finally proved her idea: the first pilot firms were on board and their success stories showed that the model works. With some of Germany’s most innovative foundations as funders and various awards, Zarah has quickly gained remarkable support and has become an ambassador for job market integration of refugees.